Well, well. The first Optipessimism feature after a Carolina loss. I don’t have the lack of attendance to complain about since it was the first road game, so let’s get right to it. Optimism: After a truly miserable half of offensive football, Renner seemed to clean up a little bit and settle down. In general, Renner wasn’t asked to do a whole lot throwing downfield. That’s about it for optimism. Of course, the week after I gush over Renner’s potential he takes a step back. 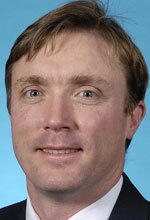 Pessimism: This was undoubtedly Renner’s worst game as a Tar Heel. His stats weren’t terrible – 17 of 25 for 204 yards , 2 TD’s and 2 INT’s – but this is one of those cases where stats don’t tell the whole story. Both of Renner’s picks came at particularly bad times, both when UNC had momentum off takeaways of their own. Both were especially bad decisions in a game filled with them; Renner’s first interception was thrown into quadruple coverage. I didn’t even know someone can have quadruple coverage on them. Renner looked extremely young in this game, often running scared out of the pocket and taking a lot of sacks he probably could have avoided. Optimism:Gio Bernard continued his stellar play, rushing for 155 yards on seven carries. Every game, the announcers (we’ll get to them in a second) mention the difficulty of locating Bernard, who’s listed at 5’10” but definitely isn’t that tall, behind a hulking offensive line. This seemingly filler content is actually true; Bernard often seemed to simply appear in the hole, much to the disbelief of the Tech linebackers. 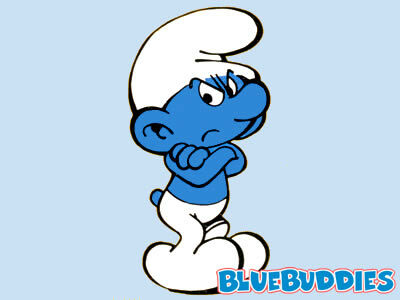 Bernard is SLIGHTLY taller and faster, though the smurfs have cooler helmets. Pessimism: It’s hard to nitpick an awesome performance like Bernard’s, though he does tend to want to bounce it outside too much, which will get him in trouble against faster defenses. It’s pretty easy, though, to go after the offensive line. There were a number of plays – mostly on screens – where lineman gave up on the play while Bernard either waited for them to engage their man or was being tackled. In pass protection, UNC struggled with picking up the 4th rusher in Georgia Tech defensive coordinator Al Groh’s 3-4 defense. Without getting too technical, a 3-4 is often tricky to figure out because it allows for tremendous formation flexibility. The offensive line, especially tackle James Hurst, struggled when the extra rusher came from the outside. Renner often felt the pressure, panicked, and ran into another defender. Many Carolina fans will be after offensive coordinator John Shoop for being too conservative, but it’s not his fault the line blocking was so bad he couldn’t drop back and pass at will. Execution wins or loses games. The lack of execution on the line this week is particularly worrisome, because neither the UVA defense or the GT defense were particularly good. Jones: Bryn. Throw me the ball. Renner: Okay DJ. I will. Jones: No. I mean throw me the ball every single play. Jones <cutting him off>: Or I’ll duct tape you the goalpost and take your pants. Bryn Renner pass complete to Dwight Jones for 41 yards to the GTech 33 for a 1ST down. Bryn Renner pass complete to Dwight Jones for 13 yards to the GTech 20 for a 1ST down. Bryn Renner pass complete to Dwight Jones for 4 yards to the GTech 8, GEORGIA TECH penalty 8 yard Personal Foul on Ty Rawlings accepted for a 1ST down. Bryn Renner pass complete to Giovani Bernard for 2 yards to the GTech 6. Bryn Renner pass complete to Nelson Hurst for 6 yards for a TOUCHDOWN. On the first play, Jones broke what I counted to be seven tackles before he went down. Everyone in the stadium knew he had “The Look.” Jones had The Eye Of The Tiger, or as Beerfest calls it, “The Eye Of The Jew.” By the time Jones was done, he had single-handedly brought UNC to a tie game with the Yellow Jackets. Alas, Groh finally figured it out and decided to shadow Jones with his own personal entourage. Renner threw a pick in Jones’ direction soon thereafter. Jones has officially become The Man, a role unfulfilled since Hakeem Nicks went pro. 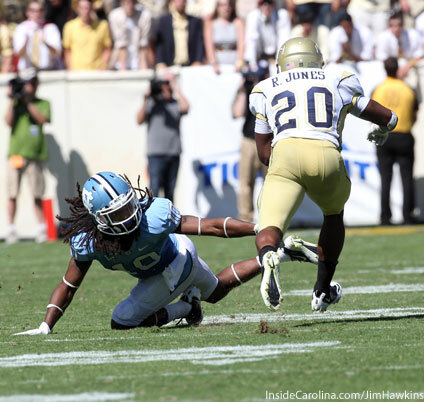 Pessimism: Besides Jones, drops plagued the Carolina receiving corps. Renner’s initial struggles can be attributed at least in part to the dropsies. Speedy wideout Jhay Boyd seems to keep losing the ball in the sun, and he and Renner have yet to develop any kind of serious chemistry. Jones? The Man. Boyd? Not quite there yet. Optimism: Defensively, UNC was… not good. The plus side of it all was that Georgia Tech didn’t score sixty points. Getting starting defensive back Jabari Price back next week from injury will be huge for a battered secondary. Pessimism: UNC did okay containing the triple option in the second half, but the first two quarters were brutal. The corners continually got caught on chop blocks. Missed tackles all over the field were a huge problem that turned 1- and 2-yard gainers into 6 and 7 yards. The 35 points GT did put up on the board were deceptively low; Tech receiver Stephen Hill dropped a wide-open bomb that should have pushed the scoreline to 42, and Georgia Tech elected to punt on a couple of makeable fourth down opportunities that frankly stunned me. I mean, when you average like a 7-yard run every time you run option right, why not go for it on 4th down from the opponent’s 35-yard line? UNC should be very, very worried about next week’s night game in Greenville against East Carolina, because they pass the ball pretty much on every play and the secondary is the clear weak spot of the defense. He never quits. Neither does Pappaletti. by Chevy and Brett Favre’s jeans. On the kick catch interference call (see below), Mattavince Papaletti went to ground with the kick returned with pretty much zero shot of wrenching the ball away. But gosh darn it, the kid tried. It was heartening, in a strange way, to see this small defensive back wrestle with a guy eight inches taller for a ball he had no chance of taking away. Papaletti was later seen stalking the sidelines, speaking words of encouragement to the offense. This kid grows on me more and more every week. Even if he is a liability in pass coverage. Optimism: After years of watching the majority of UNC games on horrible regional networks like Raycom, I have to say I generally loved ESPN’s coverage of the game. The blot on the record had to be commentator and former coach Bob Davie, but his “slow” comments were more John Madden stupid – “Carolina would love to score points here” – than the usual Raycom editorial idiocy. The duo of Davie and play-by-play guy Bob Wischusen beat on the referees for a number of bad and missed calls and nailed a really illuminating difference between how UNC and GT line up (GT leans forward at the line to fire off the ball better, while UNC linemen are more often sitting back for pass protection). Pessimism: Ron Cherry needs to be removed as a referee. Generally, I love it when a referee crew has a quiet game, but they collectively missed a LOT of calls. Georgia Tech, besides their usual (legal) chop blocks, were often holding on the outsides of the pitch plays. Carolina’s defensive ends got mugged a number of times. Carolina wasn’t without fault, either; on a couple of Bernard’s long runs through the Tech secondary, the crew missed some very easy holding calls as well. Bryn Renner, and coach Everett Withers for ostensibly not being ready to play. I’m no Shoop apologist – I thought the guy should have been fired in the offseason – but the gameplan was to extend possessions by milking the run game and limiting turnovers. With the line playing as poorly as it has the last two weeks, it should come as no surprise that Shoop kept it on the ground maybe too much in the first half. Many fans point to a draw play run late in the game on 2nd-and-17 as evidence of ineptitude; what they don’t realize is that the Heels were in certain 4-down territory. While a draw play certainly wouldn’t pick up 17 yards, a well-executed one could give you two chances to convert from less than 10 yards away. Sadly, the offensive line totally sucked. As for Renner, I can’t argue with those who criticized him. The kid had a bad game. But remember, he’s a young quarterback making his first start on the road. You can’t expect him to be a world-beater so soon. In short, this was a game I didn’t really expect Carolina to win, but they showed a lot of heart and never quit. There is still hope for a good season here. Keep the faith. This entry was posted in UNC and tagged Bryn Renner, Everett Withers, Georgia Tech, Gio Bernard, John Shoop, Nate Friedman, Optipessimism. Bookmark the permalink.